Curtis Pools offers more than forty years of experience and skilled know-how to the building of high quality swimming pools throughout South Africa. Based in the Province of Gauteng, which means “Place of Gold”, we strive to always build swimming pools to a ‘Gold Standard’ securely based on “durability, aesthetics and affordability”. Throughout the entire process, from design, installation to final finish, our task is always focused on creating swimming pools that transforms our client’s vision and individual requirements into reality. At Curtis Pools, introducing our clients to both the durability and versatility of Gunite Pools, for example, always goes hand in hand with quoting affordable swimming pool prices. From there, we are committed to helping our clients every step of the way to ensure we always complete their project on time – and to budget. 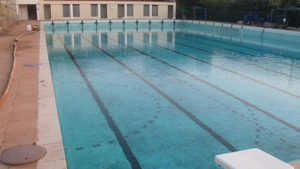 In some cases, a standard pool construction may require a surface replaster after 5 to 10 years. That’s why we are often called to carry out pool renovations or in some cases, more extensive repairs. Our approach is always thorough and detailed with a complete inspection carried out to precisely pinpoint the emergence of wear and tear. Seasonal temperature changes causes the constant expansion and contraction of the water and the penetration of the surface finish to form tiny cracks. In time, aging can inevitably lead to cracks, chips and hollow spots, affecting the surface plaster and resulting in one or more coatings to flake and separate. Renovations or repairs to a Gunite swimming pool will require a trained and experienced eye to evaluate the full extent of the damage. Only when an inspection to carry out pool renovations is completed to our satisfaction do we then provide a full quotation. On approval, the work proceeds as per the agreed schedule, within the stipulated time-frame and to budget. When you build a swimming pool, one of the first prerequisites is that it should be a solid construction that lasts for a long time. In this respect, gunite swimming pools becomes the best choice. We at Curtis Pools have been operating in this space for over three decades and have handled all type of projects that involved gunite installations, for residential and commercial customers. Over the years we have built a very strong reputation in the region and tackled projects of every scale. Strength & Durability– It’s important to get this installation work handled by an experienced contractor. This ensures it will last for a number of years without any trouble. Since it has a strong reinforced steel grid, the structure becomes very strong and does not lose its shape. Design Flexibility– While property owners want value for money and long lasting swimming pools on their property, they also focus on aesthetics. They want the pools to reflect their personal style. Gunite is a very versatile material and it’s possible to build pools of various shapes and sizes with this material. Install Anywhere- Gunite has a very minimal installation footprint. This reduces the cost and the interference and is ideal for places where other projects are simultaneously underway. 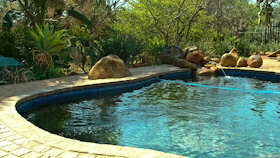 Value Add- These swimming pools are a definite value addition to your property. The minute you have a well-constructed pool, it ups the resale value of your home. Curtis Gunite is a company that has been providing high grade, customised solutions and we have handled a large number of swimming pool installation projects for commercial and residential customers. While we provide excellent pool design and install service, we also provide repair and maintenance solutions; this helps keep the pool in a good condition for a number of years. We assure you high grade service and personalised services that are right in-line with your requirements. For more information about these services, Curtis Gunite is the company to call at +27 82-652-5205. Alternatively, use this online form to contact us and tell us what your swimming pool requirements are.